Enjoy luxury accommodations in a secluded 40 acre private forest overlooking majestic Lake Arrowhead: just right for corporate retreats, workshops or family reunions. Pine Mountain is a special place to regroup with others, build camaraderie and create unforgettable memories. Pine Mountain offers a unique opportunity to experience another time at a slower pace. Most of our guests don’t want to leave. Sun and Snow: A place for all seasons! Pine Mountain offers unparalleled recreational opportunities; in the summer there is walking, biking, swimming at the lake and free concerts in the Village. In the winter, snow skiing and commercial sledding is only 20 minutes away, or sled outside the lodge’s front porch or snowshoe on the property. 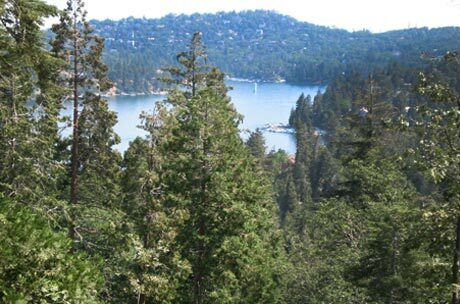 Year-round, Lake Arrowhead Village offers terrific shopping and entertainment opportunities. Capacity, 22-28 people. Exclusive use of the entire property is $1800/night with a two night minimum. 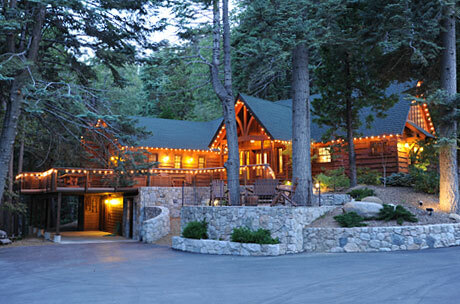 This includes Ponderosa Lodge, Sugar Pine cabin, and two small outdoor cabins. See Accommodations. Five Star Experience! I've had the pleasure of being at the Pine Mountain Camp on more than one occasion. There's nothing else in our mountains that can match it's customized quality of construction, mountain atmosphere, or attention to detail for a perfect get-a-way experience! It's a "Five Star" rental for any family or group gathering. It's also a very short drive to the lake and Lake Arrowhead Village. My husband and I have been guests at this lovely property more than once and would encourage anyone who loves nature AND comfort to book ASAP!